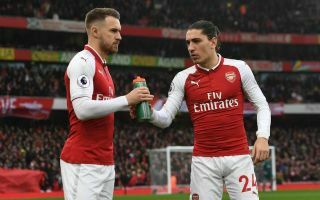 Arsenal and Spain star Hector Bellerin has offered an exciting insight to Gunners fans about what life is like under Unai Emery for him and his teammates. The defender, who didn’t have the best of campaigns for the north London side last season, uploaded a picture to Twitter with the caption “Learning from the get go”. This tweet can fill Gunners fans with confidence that their side’s new manager seems to taking a very hands-on approach to his role with the north London club. Emery impressed during his times with both Sevilla and PSG, where he oversaw his sides win three consecutive Europa League titles, as well as a Ligue 1 title respectively. Bellerin had a season to forgot this year, and it seems as if Emery may need to give him a bit of guidance if the Spaniard is to get back to the level of performances that we know he’s capable of. It seems that Emery is willing to personally teach his players about the way he wants them to play in order to get the club producing the kind of performances that we know they’re capable of on a consistent level. Emery could prove to be a shrewd signing for the Gunners this season. Here’s hoping he can get the north London back where they deserve: seriously challenging for the Premier League once again.